Abstract fish shaped dish with flat tab handle. Shallow bowl with oval footring. Spur marks to base, green gloss glaze to entire body. 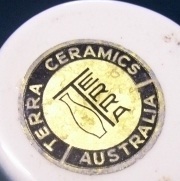 Gold and Black Adhesive label to centre of bowl interior “Terra Ceramics Ovenproof” around outside with “Terra”vertically to right of interior and outline of vase to left with large letter “T” separating them. Gloss brown glazed bowl with moulded stem handle to top edge of exterior. Unglazed foot ring. Darker glaze to rim. Called "Bermagui Blue" by Bernard, one piece gloss blue glazed to interior and exterior bowl with slightly curled moulded tab handle to top edge of exterior. Bernhard Fiegel was born in Germany on the 1st January 1919. He arrived in Darwin by air, 8th November 1939 as a stateless person. Moving to Paddington, Sydney, where he enlisted for service in Australia during World War 2 having become an Australian citizen in October 1945. A Ceramicist, he began teaching pottery at Ingleburn in the Australian Convalescent Depot, working with Guy Boyd, after Boyd had worked as an Army cartographer with John Perceval. Fiegel was a Dutch-trained potter and ceramicist and was a Jewish immigrant whose family had fled Germany at the beginning of WW2. Thanks to Bernard's daughter Naomi for this photograph of him. 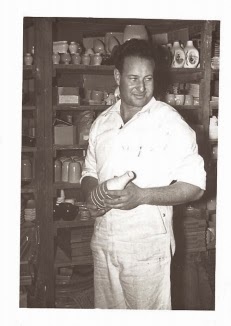 In 1946, following his discharge, he set up a ceramics business in Ashfield, Sydney, (he lived at 81 Bland Street Ashfield with Erna Fiegel his mother) who helped as a factory hand) later moving to Greenacre. Bernhard was previously married to Marianne Leonie Fiegel, but was divorced in March 1952. He later married Jean May Stocker Gunn. He had two children, Paul and Naomi. Marianne went into nursing. He produced a variety of ceramic wares using the brand Terra Ceramics”. Terama was the name of a floral pattern. He continued production until the early 1980s. These fish shape ramekins are an example of the elegant simplicity of his later work. Fish shaped pottery was popular in Australia during the 1950s and 60s, more so in the state of New South Wales, with Diana pottery at Marrickville producing many ramekins with a fish design. In 1981 Bernhard died, but twelve months earlier he had started negotiations with Trugrit Manufacturing Ltd to have his product made in NZ under licence. A new company "Terra Ceramics NZ" was formed using the same raw materials and clay body. They then shipped all of their moulds and other machinery over to Aukland in containers. This new company was run by Mr Ernie Cooper, a qualified Ceramist. The new company was located at 18 Copsey Place, Rosebank Rd, Avondale, Auckland. H.Hemara, now the elder statesman of New Zealand pottery was working there when the crates containing the moulds were opened in New Zealand. Moulds for Terra were later produced at the Henderson pottery. 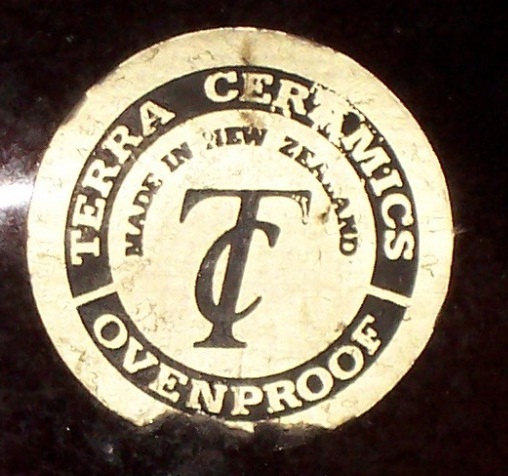 Initially, the company used the same stickers but later changed them to read Terra Ceramics, New Zealand. Hemara is still making pottery along with his son Paul. So is Terra Ceramics New Zealand. 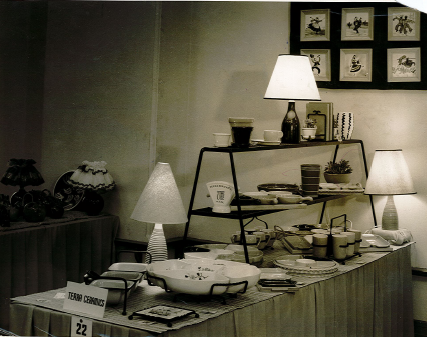 Thanks to Bernard's daughter Naomi for this photograph of a display of Terra Ceramics 1953.. It may be that Naomi had the date incorrect or that the State Library is in error. Or am I wrong? Thanks for a wonderful and enlightening post on TERRA CERAMICS and BERNHARD FIEGEL !!!! I have come up with an address for the pottery in Greenacre : The corner Oleander St and Roberts Rd Chullora. The phone number gave it away: Tel. UA3641. An Ashfield number but from 1954 the same number was used to advertise for employees at the new address : "BOY Wanted for Art Pottery Int work gd cond Oleander St Cnr Roberts Rd Chullora UA3641" ( SMH - Saturday 2 October 1954 p 36 ).